Objective: Pregnancy and depression affect each other. 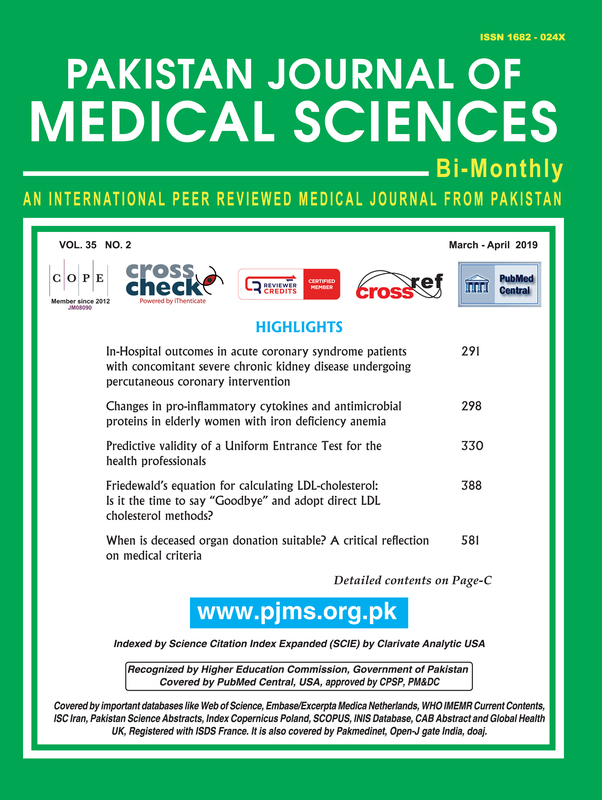 The main objective of our study was to find out frequency of antenatal depression during last trimester and associated risk factors among pregnant female visiting a tertiary care private institution of Lahore, Pakistan. Methods: This study was conducted at Shalamar Hospital a private tertiary care institution of Lahore during May 2017 to June 2018. Assuming 18% prevalence with design effect 1.5 and 97% confidence interval the calculated sample size was 417. To avoid dropouts the questionnaire was administered to 450 pregnant females in their last trimester that is with gestational age above 28 weeks. In this study we used a modified version of Goldberg’s depression scale in Urdu language for data collection. Wherever needed the data collection team read out aloud the questionnaire to the participants who did not know how to read and write. Informed consent in a written form (in Urdu language) was taken from every study participant after explaining the participants about the research. If the participant did not know how to read and write, the interviewers narrated out aloud the script of informed consent for them and got it signed later by the participants. The confidentiality, anonymity and privacy of the study participants were preserved. Ethical approval of this study was obtained from Institutional Review Board of Shalamar Institute of Health Sciences. Data entry and analysis was finalized by using SPSS version 20. Results: The prevalence of depression among women seeking antenatal care during their last trimester according to Goldberg Depression Scale was 40.89% (n=184).Whereas, 30.4% (n=137), 8.67% (n=39) and 1.78% (n=8) suffered from mild, moderate and severe depression respectively. The associations between passive smoking (p < 0.01), family history of preeclampsia (p < 0.05) and depression among family members (p < 0.05) with antenatal depression during last trimester were significant. Conclusion: According to Goldberg Depression Scale, 40.89% (n=184) of pregnant women seeking antenatal care in private tertiary care institution of Lahore suffered from depression.